The series of paintings "Anima" outlines the nature of "Animus" feminine aspiration, is the personification of the most desired woman : "The unreachable feminine ideal." 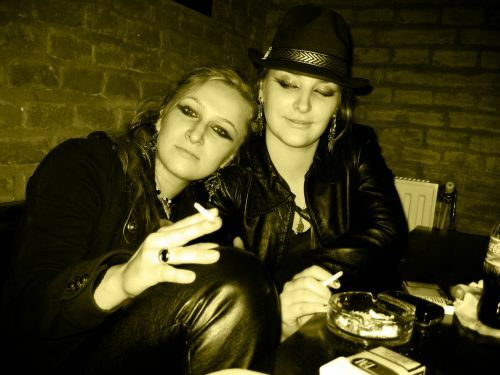 Safir(Dorina Pantea) and Rifas(Diana Pantea) born on 11.23.1987, 28.04.1983 in Deva. Over the years of study in faculty, master and PHD studies, we gained the experience and values necessary for any artist, also we consider that, the diversity in ideas and concepts is an essential addition to development and introduction of 'innovation' in the Art World:'the image create the most magnificent cocktail of effect and sensation'. What we mean is that we are , professionally trained and educated in both traditional and digital art, but always there are new things to learn, just to be given the chance to do so. The new values that we would bring through our creation in Art is that the diversity and originality would be present in our ideas and artworks that would become not only feasible but also of massive impact. Our creations include traditional painting, figurative or abstract, original concepts, photography, photo - manipulation, digital art. Mixed technique paintings are made by joining or patching pictorial surface with different combinations of materials and textures of cloth, cardboard, plywood, crystals and pulp color, well integrated in the coherence compositional structure. On the one hand, we give free will to the flow evolution and informal gestures, stimulating disintegrative forces, and on the other hand, clarifying forms of human traits, these wandering spirits are pushed to the limit of a symbolic dialogue with the audience. Substrate raise topics of psychological, philosophical, mystical, mythological, fantastic, romantic, literary, mathematical, metaphorical vision prior to painting, through metamorphosis and anamorphosis the figurative to the abstract images, from real to imaginary. 'Diversity and originality are two concepts that characterize me. When someone chooses to go on a single road, his vision is blurred and he will not notice anything around him, this happens in art also, so I chose not to follow only one 'art direction',instead I divesified my artistic approach. One thing can be recognized in my work and this is the personal touch of my style, this does not change, it's an personal and artistic DNA. 'Matter and deformed concept of the relief form are the two approaches that define my art.What I want to output through my work is that whatever has shape, color, and relief and is tangible as matter is ephemeral. Materiality does not last, and yet, we are trying to capture its time and duration through painting. Everything starts from a point, then materializes in a form, a notion of reality. Reality defines us but we are not characterize by it, what makes us unique is our imagination and creative ability, that's why my artistic theme has varied artistic approaches, and the link between real and imaginary is the raw material and the relief applied on evenness of the canvas. Experiment', at the University Library BCUT Hall and Gallery Pygmalion , Timisoara. 2006 Personal exhibition of computer graphics, '2D Experiment', at the Cultural Center of the Library of Octavian Goga, Cluj-Napoca. Experiment' BCUT Hall at the University Library and Pygmalion Gallery, Timisoara. 2011- Exhibition 'Im Kontext' - Hans Schnell Internationale Kunst der Gegenwart, Austria, alongside famous artists such as Josef Beuys, HANS SCHNELL, PAUL SCHNEIDER, EMIL SCHUMACHER etc. 25-25.09.2010 Participation Diploma in Ad-Hoc Painting Contest from Campina 24H, 5th edition,Campina.